Better Excel Exporter for Jira Server was called "Better Excel Plugin for Jira" until 2018 Sep! Also generating business documents from Jira? Check out our PDF exporter app! Sorting the comments as "newest first"
If you never export directly from the Jira Agile boards, you may want to hide the menu drop-down buttons placed there by the app. To do that, go to Administration → Announcement banner, add the following snippet to the Announcement text area, then hit Save. Users often times prefer to have a list of ready-made export links that generate the export with a single click, instead of manually running a saved filter and then exporting the results from the "Export" drop-down menu. Quick links can save lots of time and tedious navigation. Open the "Export" drop-down, right-click the menu item representing the export type you wanted to use, and copy the link to the clipboard. Now insert the link from the clipboard into a "Text" type Jira gadget (tutorial), into a Confluence page (tutorial), into a website, CMS or any other tool that allows sharing and categorising URL hyperlinks (bookmarks). Yes, it is really that simple. Please note that these hyperlinks are secure, meaning that even if you post them to some external system, clicking them will direct your browser to Jira, which will require you to properly login if you aren't yet. In most of the cases, you don't need a secondary filter. JQL, the query language used by Jira, is extremely flexible and allows implementing complex searches. You should just set up a saved filter in Jira, run that and export the result set. In those cases when JQL is not sufficient, or you really need to execute a second filter, you can do that in the template. In most of the cases, you can flexibly sort issues in JQL using ORDER BY. You can implement any kind of flexible sorting logic based on this example. Although the most typical examples are the issue key or summary cells, you can generate hyperlinks into any Excel cell using the example below. This allows users intuitively click issue keys or summaries to jump to the Jira page of the corresponding issue. If you want to export sub-tasks in the same way (same fields, same formatting, etc.) as the top-level isssues, you can use a simple trick: prepare a list by merging the top-level issues and their sub-tasks, and then iterate over the merged list! * Returns the passed issues merged with their sub-tasks. Custom field values can be accessed using the $fieldHelper tool. This works the same way for sub-tasks as for top-level issues. Typically you export sub-tasks while exporting their parents, but sometimes the situation may be reversed. In that case, any field of the parent issue is accessible from a sub-task through its parentObject property. * (or null in case of failure). If you need to connect to REST services, that's pretty easy, too. If you need to pull data from the local Jira instance only, prefer using Jira's internal Java API over the REST API. That's faster, easier and you completely eliminate the need for authentication. If you are worried about using BASIC authentication, it is basically fine if used over HTTPS (or the loop-back interface of your server). If that's the case in your environment, keep it simple and just use BASIC. You have full control over the user account used for making REST calls. This means, you can set up a dedicated, restricted Jira user for REST. For instance, create a user account named rest-client-acc, remove all "write" permissions, only add "read" permissions for certain projects, and then use this account in REST calls. Please read the official Groovy documentation on working with relational databases for more details. Tempo worklog information are collected using the Tempo Servlet API. Please quickly read through the details of the XML format returned by Tempo to understand the theory behind the following recipes. Please note that the worklog attributes are returned as a single comma-separated string, like: "Country=Germany,Region=EMEA,Foobar=123". Trivially, it should be split at the comma-character to get the individual attribute name-value pairs, and then split at the equals sign character to separate names and values. Better Excel Exporter is shipped with 5 variations of the issue-navigator.xlsx template, which offer further configuration options detailed below. Remember that you can flexibly use any combination of these modes, giving solutions to every kind of worksheet needs. Templates can either export all fields or only the ones currently visible in Issue Navigator. Technically speaking, there is a customizable logic that decides whether the export should utilize the table layout associated with the current search (JQL, saved filter) or use a table layout that contains all fields. Please note that there are default views created for each combinations: "current columns" / "all columns" modes for columns only, columns plus comments, columns plus worklogs, columns plus Tempo worklogs, columns plus change history. You can use these 2*5 views immediately after installing the app. When using the issue-navigator-with-worklogs.xlsx or the issue-navigator-with-tempo-worklogs.xlsx templates, there can be multiple rows created for each issue that has multiple worklogs. For instance, if an issue has 3 worklogs added, then the issue will be exported to 3 physical spreadsheet rows: the field values will only be exported to the topmost row, and then each worklog will appear in its own row. From app version 2.4.0, the repeating version of the issue-navigator-with-worklogs.xlsx is available as issue-navigator-with-repeating-worklogs.xlsx among the default templates. Similarly, the repeating version of issue-navigator-with-tempo-worklogs.xlsx is available as issue-navigator-with-repeating-tempo-worklogs.xlsx. If you need both the default and the repeating mode, then create a new intuitively named Excel view and use the repeating template with that. For instance, add a new view name "Worklogs rep. (Current f.)" with the issue-navigator-with-repeating worklogs.xlsx template. If you need the repeating mode only, then switch your existing Excel views to the repeating version of the corresponding template. For instance, switch the "Worklogs (Current fields)" and "Worklogs (All fields)" views to the issue-navigator-with-repeating worklogs.xlsx template. Please remember that you should use the repeating mode primarily for reporting and data transfer purposes. Compared to the default mode, the repeating mode Excel files are less human-readable, require more time and more memory to generate, and larger in physical file size. There are times when you fail to reference a Java (Groovy) class by using an import statement, as the class is made available for apps by Jira. For example, you'd like to get the JqlQueryParser component from Jira, but the Groovy interpreter cannot import its class. The problem is due to Jira running apps in an OSGi environment with controlled classloading. Groovy scripts run in the same environment as the app that executes those, therefore the same limits affect scripts, too. // we have a working query parser, yay! It is up to you to implement more complex coloring based on this example. 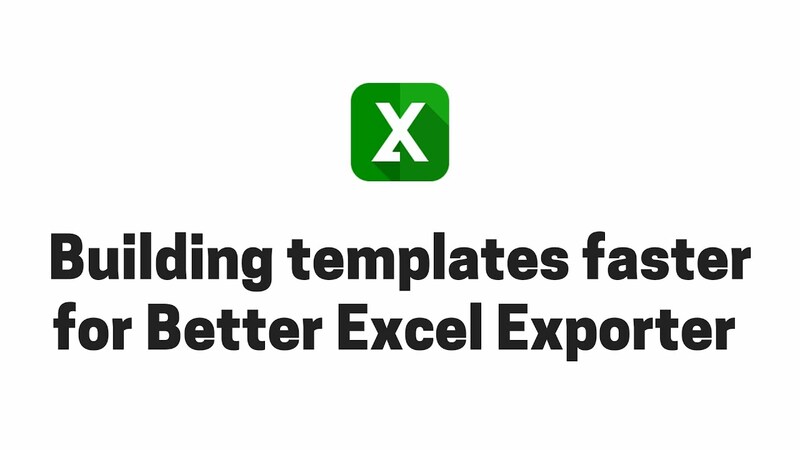 You can use expressions in Excel worksheet names, too. Please note that Excel limits worksheet names to 31 characters! "A2" is the cell for the Time to Resolution SLA time value, which itself is exported using the $fieldHelper tool. Exporting "Is met?" is just the inverse of the IF() formula in the above example. Excel files are exported using the language selected in the Jira user's profile who initiated the export. Sometimes, although you are using English, want to create exports in German without switching your language to German for the time of export. This is also doable. From this point, all calls on $i18n will produce German texts. Hint: see the commonly used locales in the Jira manual. We use a super-simple best practice to make our templates "debuggable", both while developing it and after they are deployed to production. See the logging from scripts section in the Scripting page. See the debugging scripts in Jira section in the Scripting page. When you work on a more complicated Excel template or script, you may find it inconvenient that you need to upload the modified files to Jira again and again. The app supports a special type of working mode called the "developer mode" (or "devmode" in short), that helps avoiding this. How to activate the developer mode? By specifying a single JVM parameter, you can override the app's resource loading logic. jxls.dev.resourceDir /path/to/my/templates Excel templates and Groovy script files will be loaded from this file system directory (instead of using the files uploaded to Jira). Note: when we say "file system", it means the file system of the Jira server, obviously. You cannot use devmode to run Jira on some external server and edit the template files on your local computer, unless you mount your local file system to server's file system. How will you work in devmode? Open the Excel template you are working on in Microsoft Excel. Every time you change something, just save the file, make a new export, and you changes are immediately visible! Open the Groovy script you are working on in a text editor or IDE. Save the file, make a new export, and your changes are visible. Devmode will make you super-productive until you stop Jira and even after restarts, as long as the parameter settings are in place! If you finished with the template, stop Jira, start that normally without the devmode parameter, and upload the latest versions of the template and script files. For heavy template development or scripting work, we suggest using a Jira developer instance, and "releasing" the completed templates by uploading them to the production Jira.